The promotion puts hundreds of Smashwords authors in the hands of the romance industry's most influential participants. This promotion is one of the many perks of working with Smashwords. 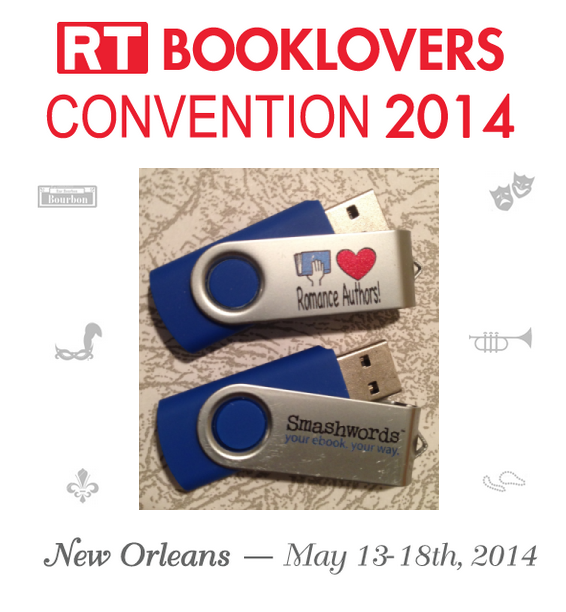 It's our way of saying thank you for publishing and distributing with Smashwords! We hope to do similar promotions in the future to support our authors. If you're on the conference planning committee for a large (500+ attendees) writers conference, drop us a line! In this workshop, you'll be the first to learn the results of the third annual Smashwords Survey, an RT Booklover’s exclusive. Check out last year's 2013 Smashwords survey here. Next week I'll post the new survey here at the blog. I'll do a deep dive into preorders, the most significant new sales tool for romance authors. Learn strategies and best practices that will help you increase the discoverability, merchandising and sales of all your titles. I'm on a panel moderated by the amazing Sylvia Day. Other panelists include Lindsey Faber (Samhain), Kristen Proby, Karin Tabke (aka Karin Harlow) and Stephanie Tyler. Join us as we discuss the benefits and pitfalls of self publishing. I'm joining Smashwords mega-bestseller Kristen Ashley to discuss everything you need to know about self-publishing – from formatting, pricing and cover design to growing your fan base. You’ll also hear Kristen’s self-publishing journey – from deciding to self-publish to quitting her day job to negotiating a publishing contract. Thank you so much, Mr. Coker! I really appreciate the opportunity and am grateful for your efforts to help promote my books! Mr. Coker, thank you for giving the opportunity to promote my book. This is awesome! Thanks for having me on there. Really exciting, they look great! Thank you for including my book. Great promotion. Smashwords ROCKS!!! I really appreciate this wonderful opportunity. Wish I could go to the RT but leaking roofs have put a stop to that plan! LOL Maybe next year...it's a long way from Down Under to the US. Hve fun! Thank you very much, Mark. It is really amazing. You do so much for the writers. God bless you. Thanks for the opportunity to include one of my books, Mr. Coker. I really appreciate it! I'm honored to have gained a spot for Union of Renegades among such fine company. I hope the convention goes well for everybody. They can be a lot of fun. Thanks Mark and the Smashwords' Team. You all Rock! So excited to be a part of this. Thanks Mark for the opportunity. Thank you for including my book Run Rosie Run in this promotion, Mark. I really appreciate the opportunity to reach thousands of new readers. I can't attend RT this year, but I'm planning to attend in 2015! What a wonderful opportunity for free promotion. Thanks for including one of my books, Mark. All the best of luck for everyone participating. This is a great opportunity for independent authors. Thank you so much! Before Smashwords, I didn't believe there was a company out there with a focus on helping independent authors truly succeed. All I can say is that I have been impressed with Smashwords from day one...and they continue to amaze me with how much they care about their authors! Big thanks to Mark Coker and the whole Smashwords team!! You guys are wonderful!! Next time you produce a flash drive though, could you provide an index.html file which loads a page with covers and blurbs? It's not difficult to copy the files over to Calibre and peruse the books there, but not everyone's familiar with that program. Thank you for putting this collection together!